Several people on Facebook have asked me for this recipe so I’m doing a quickie post to get it up here. The aroma from this barbecue pulled pork cooking in the crock pot drove me insane that entire day! I cooked it on high for 5 hours and left it on warm for about an hour. Everyone kept asking what time dinner was. So delicious! The only change I made was to use rice vinegar instead of apple cider vinegar. I like rice vinegar better as it has a mellow flavor compared to some other vinegars that can be pretty harsh. I already had a bottle in my pantry, but the folks at Nakano wanted me to try theirs. I’m glad I did, it even smelled better than the one I had on hand! 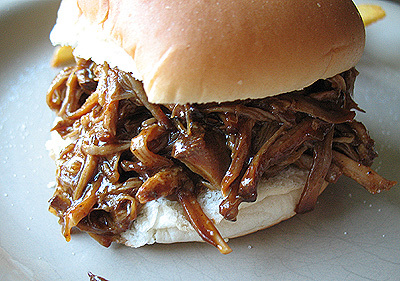 The pulled pork was a huge hit and I know you are going to love it too. Before I give you the recipe though, I wanted to let you know that Nakano has offered to give away not only a bottle of their delicious seasoned rice vinegar, but also a $25 gift card to one lucky winner! To enter, check out the details on my giveaways and review blog here! Now, on to the recipe. I hope you try this, you won’t be disappointed! Pour the vegetable oil into the bottom of a slow cooker. Place the pork roast into the slow cooker. Combine the barbecue sauce, rice vinegar, and chicken broth and whisk together. Add the brown sugar, yellow mustard, Worcestershire sauce, chili powder, onion, garlic, and thyme. Whisk everything together and pour over the pork roast. Cover and cook on high for 5 hours. Let roast sit in crock pot on warm for up to an hour, then shred the meat with 2 forks. Strain the sauce and discard solids. Mix a teaspoon of cornstarch with a small amount of water to make a paste. Continue adding water, a little at a time, to make the cornstarch mixture thinner. Add cornstarch mixture and strained sauce to a saucepan and bring to a boil. Simmer ten minutes or until slightly thickened. Pour half of the sauce into the shredded meat and combine. Add more if needed, serve the remainder on the side. Optional: Spread the inside of both halves of hamburger buns with butter. Toast the buns, butter side down, in a skillet over medium heat until golden brown. 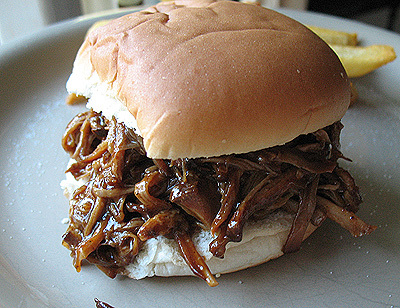 Spoon pork into the toasted buns. Hey Amanda – this has become a family favorite! I always know I can count on your recipes to turn out – this isn't the only one I rely on. I am making Amanda's FABULOUS pulled pork sandwiches again! I don't strain it because we like the cooked onions in the sauce. I do skim the fat off the sauce before I put it into the saucepan and thicken it with cornstarch. I also double the amount of sauce ingredients because we like lots o' sauce. Every time I make this I get lots of "yummmmmmm" sounds around the table. 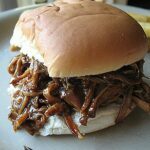 But I have to tell you this recipe of Amanda's is one AMAZING pulled pork! So glad you enjoy it! I need to make it again, especially now that the weather is cold! I am about to make this recipe for pulled pork for the THIRD time. Amanda is so right that the aroma while it's cooking is enough to drive you crazy. This looks really easy. I'm gearing up to start using my slow cooker more. It's the perfect tool when I just want to dump a few things in a pot and forget it. Vincent – Just so you know, you are earning a bad rap around the food blog world spamming everyone's comments. Whenever someone asks if anyone has herd of PetitChef, the answer is always an annoyed one. You have posted this comment on my blog probably ten times since you started. It's irritating. I have deleted many of the comments, but this one I am leaving in hopes that you will read this and 1) try contacting people privately and 2) stop commenting over and over on a blog you've already "hit". Please stop. Feathersnpaws :) Yum I can smell it from here! :) After you strain off the liquid, there aren't a lot of onions left as they have mostly disintegrated. However, you can set those aside and then run your liquid through a fat separator, then add the onions back in if you like! I have texture phobe family members, so I discard them LOL! Amanda!!!!! I'm dying here. I have this pulled pork thing in my crock pot now and it IS killing me with the aroma. Even just tasting the sauce uncooked is amazing. I'm a little unclear about the directions where you say to strain the sauce and discard the solids. Does that mean you discard all those wonderful chopped onions too? YUM!! We love pulled pork! Never have had it in a slow cooker though. Great recipe!